Mrs Rosa Kail was most impressed. She loved to often repeat the story about Mr Lorraine Wilson, a man held in high esteem in the Kail household. The incident was originally related to her by her husband James. Mr James Kail had returned from the railway station, having gone down with their son Edgar to see him off. The Hamlet team was playing away, and about to embark on their trip. 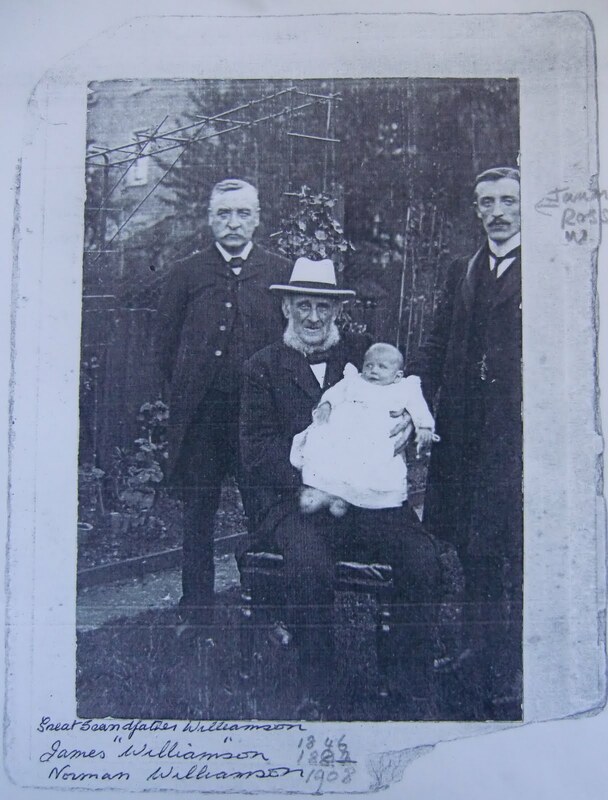 As they were ready to leave, Mr Wilson put his arm on young Edgar’s shoulder and reminded the staff to “Please take care of the boy.” Wilson’s compassion struck a chord with Edgar’s mother, who was pleased that someone was showing a genuine concern for her dear son. The touching episode left an impression on Mrs Kail that she never forgot. The teenage Edgar appears to have received little love from his austere father. A strict disciplinarian, Mr Kail demanded and received the utmost respect from his growing family. But at a cost – it distanced him from his offspring. By contrast, Dulwich Hamlet’s chief mentor Lorraine Wilson, known universally as ‘Pa’, demonstrated a more fatherly love. Pa had a wonderful track record in the supervision of young people. 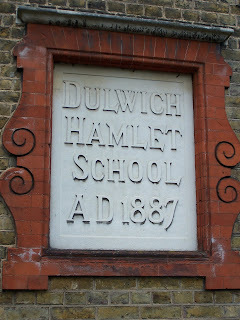 It was with boys of a similar age group back in 1893 that he had originally built Dulwich Hamlet Football Club. His fostering and nurturing of the boys that came under his wing, and the way he showed great care with those entering adulthood, was a breath of fresh air to Edgar. However, we must not take anything away from Mr Kail, who was the major influence on his young boys. He often took groups of his children (he had nine) on day trips to central London, frog-marching them to and fro like a mini regiment. Occasionally they were allowed the luxury of a tram ride to Camberwell Green, where they would usually alight before continuing on foot. The part of East Dulwich where they lived is built between two hills, and even the shortest of journeys invariably involved climbing a height or two there and back. Mr Kail even instructed his children how to walk uphill properly, “Lift your feet up. Keep your shoulders back.” It was good tuition for young Edgar, who would later climb the heights that most schoolboys only dream of. Mr Kail also demanded that if a Kail boy needed money for anything, then he had to earn it. He always encouraged his children to be active and useful, and taught them to value the uttermost farthing. And it paid dividends; these precepts and principles learned in youth remained with the Kail family throughout their lives, especially Edgar, who, as well as being prudent would not receive any sort of payment under false pretences. Before the First World War, Edgar earned his pocket money by doing an early morning paper-round with his brother Fred. The strict routine and good practise was made simpler by a grandfather clock (minus its minute hand) that stood at the foot of the stairs in their Nutfield Road home. The defective yet efficient timepiece governed the Kail household, sounding out the routine of the day, striking the boys into the good habits of timekeeping and dependability. Following payday, and with sixpence each, Fred and Edgar often walked the couple of miles up to Camberwell Green to enjoy an evening in the old music-hall theatres. There were two at the Green, the Camberwell Palace of Varieties and the Camberwell Empire, where, seated in the ‘gods’, the lads got to see some of the leading entertainers of the day. Little Tich, Harry Champion, Marie Lloyd, George Roby, Harry Lauder and Fred Karno’s Troupe with the little known Charlie Chaplin in the ranks, were all seen. When the first show was over they crossed the road to the other theatre to repeat the exercise, but not before they had had something to eat. While Edgar queued for tickets for the second house, Fred popped round the corner into Coldharbour Lane and brought back fish and chips. At the end of the evening, and with the time getting on for eleven o’clock, they traipsed home in the dark to East Dulwich, musing over the twenty or so first-rate turns they had seen, undoubtedly reminding each other of the best and funniest bits. They would be sure to get in before the clock struck, or else dad was waiting at the door with a slipper in his hand. Edgar Kail began his schooling in September 1905, attending the Goodrich Road School just a five minute walk down the hill. He remained at Goodrich until he finished his education in his mid teens. London County Council Inspectors at the time described Goodrich as a “large and difficult school...but well maintained.” Some of the school logbooks from the early part of the 20th century are today kept at the London Metropolitan Archives. They record the day to day events that took place in the life of the school. Class trips to the Tower of London, the Monument, Kensington and Horniman’s Museum are all noted, as are local visits to Peckham Rye Park, One Tree Hill, Brockwell Park, Dulwich Park for nature studies, early morning swimming sessions at the Dulwich Baths, Shakespeare plays at the Crystal Palace and so on. Each February, a visit to the South Metropolitan Gas Company in the Old Kent Road was arranged for the boys who were soon to leave school. ‘Metrogas’ was one of the main employers in the area, where many local boys began apprenticeships, and during the First World War three thousand employees of the company served at the Front. The ‘Gasmen’ also had a football team in one of the major amateur leagues. So just think, had Edgar Kail decided on a career as a gasman after his careers visit, then the Metrogas football team may later have enjoyed his membership as opposed to Dulwich Hamlet. For schoolboys in Dulwich, the South London Schools annual athletics meeting at Crystal Palace was the highlight of the summer term. Crystal Palace was the home of the FA Cup Final, and many of the boys taking part in the games must have imagined themselves running out in front of a cup final crowd. The organizers of these day-long events received much credit, as often, huge gatherings of four figures took part, whilst many more watched the youngsters from the terraces. Among the supervisors largely responsible for the day’s proceedings one could always find three well-known faces. Before the First Word War George Wheeler was the chief judge and referee of events, Bob Crump was another of the judges and Bert Hardy fired the starter’s pistol. These three men were leading officials of, or associated with Dulwich Hamlet Football Club. When the Kail boy grew into a man these three good men became his friends and colleagues. What a great thrill for the Kail family when they picked up their South London Press on Friday June 24, 1910, to see nine year old Edgar’s name in print, probably for the first time. Little did they realise that over the next thirty years his name would hardly be out of the paper, gaining fame as one of the best known sportsmen in the country. Representing Goodrich Road School, Kail came runner-up in the final of the Under 12s 440 yards handicap race. South London’s leading journal described it as “a grand race won by three yards, a foot and a yard separating the next pairs.” It was not the only medal for Goodrich Road, they also won the tug of war. In the 1911 report, Edgar Kail’s name does not appear in the placings among his contemporaries from the previous year. He may have been absent, or he may have had a rare off day, but he is back for the June 1912 games. Competing in the Under 12s 440 yards race he won his first heat, whilst in the 100 yards sprint, he won both heats, his second round time being 14 seconds. Alas, in the final he finished at the tail end, only three yards separating him from the winner. Incidentally, running in the 220 yards was F. Sivewright – could this be the same person who ten years later became a team mate of Kail’s at Dulwich Hamlet? The South London Schools Cricket and Athletic Association held its 22nd annual sports meeting in June 1913. Again in the press report (SLP June 27, 1913) we find Edgar, now 12 years old, appearing in three events. He finished first and third in the heats of the Over 12s 220 yards and won his first heat in the 100 yards sprint. He also came second in the obstacle race having won the heat. Edgar wasn't the only member of the Kail family there that day - his younger brother Harold did very well in the heats of the Under 10s 100 yards. Up the road from the Kail family home was Dulwich Park. Less than twenty years earlier the Dulwich Hamlet Football Club, in its infancy, used the park for its home fixtures. One of the park’s main features, indeed the central attraction, is the picturesque boating lake. In Edwardian times sand blown over from the bridal path onto the tarmac surrounding the lake produced a gritty surface that was as near to the racetrack at Crystal Palace as one could find. The ideal location where the young athlete could practise his running. So it was here that Edgar, overseen by his father with the stopwatch, perfected his starting and finishing, his breath control, and the things that accompany attainment. All the training eventually paid off, and in June 1914 Edgar Kail finally gained a winner’s medal in these games. Having recorded the best time in the heats of the 440 yards race - the only boy under 60 seconds - he went on to win the final by two yards, and a time of 57.8 seconds. The close race was made more exciting as the young Edgar was up against his schoolmate, W. Jones, who finished second. It was a triumph for Goodrich Road School, and a personal triumph for the boy champion. In the 880 yards (half mile handicaps), Edgar completed the two laps of the Crystal Palace track in bronze position, six yards separating him from the runner up. Freeman’s Ground at Champion Hill was another football venue close by that was drawing larger and larger crowds as its occupants, Dulwich Hamlet FC, started collecting silverware on a regular basis. Improvements were made to the ground, and before long it was being used for many other representative games, including semi-finals, and county and schoolboy matches. The columnist F.B. Douglas-Hamilton was watching such a match at Freeman’s Ground one Saturday in 1910. Of all the players on the field, it was the handsome little kid playing up front which caught his eye. He wasn’t alone either, it was the opinion of a number of others that the lad with the exceptional skills could make the grade and one day become a famous player. The diminutive forward was a few years younger than the rest of his team-mates who ranged from thirteen to fifteen. The match in progress was a trial to pick the school team. Two Kail boys were being considered – thirteen year old Reginald, who was hoping to be promoted from the second team, and his nine year old brother Edgar. Suffice it to say that the younger sibling won a place whilst poor old Reg remained in the reserves. A year or so later Edgar was made the captain of the Goodrich School side. When war with Germany broke out in August 1914 Edgar Kail was acting as the scorer for the Dulwich Hamlet Cricket Club. Despite his youth and slight stature Edgar was being noticed as a general all-round sportsman, and perhaps it was only a matter of time before he was good enough to take his place in either the Hamlet’s cricket or football team. Or both; the Hamlet cricket team was virtually the football team in a different set of togs. It was to the credit of the DHCC officers to allow Edgar along for the experience of some first class cricket, and to show their complete confidence in the boy. Edgar relished the responsibility of recording the correct scores, and undoubtedly appreciated the assurance shown in him. The match in progress was on the Army Barracks ground in Caterham, Surrey, with the Guards Depot being Dulwich’s opponents. When the bugles were sounded, the game was immediately abandoned, and it must have been a very odd sight to the youngster to witness the guardsmen dashing from the field to change from their whites into battle dress! No one could have foreseen the effect that this Great War would have on the British nation over the following four years, and for generations to come. Thousands of bright young lives were suddenly plucked up and dumped in the thick of a carnage on a scale not known before, many never to return. Fortunately for us Edgar Kail was the safe-side of recruitment age. 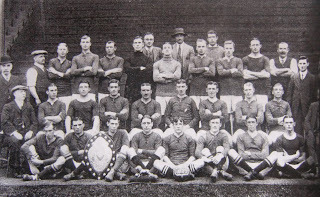 The season came and went, and May 1915 concluded what was a very unimportant nine months of football. Most clubs tried to carry on in some shape or form, but Dulwich Hamlet FC, like many others in the land, had exhausted its funds. Neither was there any need for the usual engagement in battle on the continent in the shape of an Easter tour. Players looked forward to these trips, but the hard fact was that thousands of them were out there anyway, and the majority of those fields had been “torn up by the greater conflict.” (SLP April 9, 1915) What the next season held in store in the increasingly troubled times was anybody’s guess. With most of its playing force signed up for the war, football’s governing bodies looked to schoolboys to continue the game. Increasing in confidence with every representative match, Edgar (along with his peers up and down the land) was also bringing enjoyment to many devotees, starved of league football. The young ambassador of the beautiful game appeared in the forward line of the South London Schools team that defeated East Ham 2-0 in the 4th round of the English Schools Shield on Saturday 13th March 1915. The match was played at Champion Hill, the home of Dulwich Hamlet Football Club, and it was probably at this game that a select few of his future followers first caught a glimpse of their hero. Following a bye in the first round, South London had disposed of Chatham 12-0 in the second round and Woolwich 10-1 in round three. Later in the Spring (May) he represented London in a match against Birmingham, scoring five of London’s seven goals. At the corner of Goodrich Road stood the Lordship Lane Chapel, where the Kail children, encouraged by dad, attended the Sunday School. Some evidence suggests that half the time the boys didn’t turn up at three o’clock, but could be found elsewhere, presumably with jumpers for goalposts. The folks at the church also ran the 36th Battalion of the Boys’ Brigade. The object of the Boys’ Brigade, was “the advancement of Christ’s kingdom among boys and the promotion of habits of Obedience, Reverence, Discipline, Self-respect, and all that tends towards a true Christian manliness.” One couldn’t argue with that. And it is no surprise to find included among Edgar’s collection of medals was one for the Boys’ Brigade South London Sports. That clutch of medals won by Edgar as a schoolboy also includes; the South London Schools FA Senior Winners, the South London FA Senior Bronze, TSSA London v Newcastle 1914, Camberwell Carnival School Sports and the Hardy Competition 1914 [A competition possibly organized by Bert Hardy, but more likely one associated with the ‘Hardy’s Own’ regiment of Boy Scouts in South London led by troop surgeon Dr Hardy] and the London Schools FA Silver 1915. The Newcastle match, played at Tottenham Hotspur’s, White Hart Lane, saw Edgar representing an all-London side that won 3-0. In April 1915 Edgar Kail was chosen for the English Schools FA team. He was now numbered among the eleven finest young footballers in the country and honoured with the privilege of wearing the Rose of England. The annual match versus Wales took place on April 24th, this year at Ninian Park in Cardiff. The English team was a made up of six youngsters taken from the London area and five from the North East. 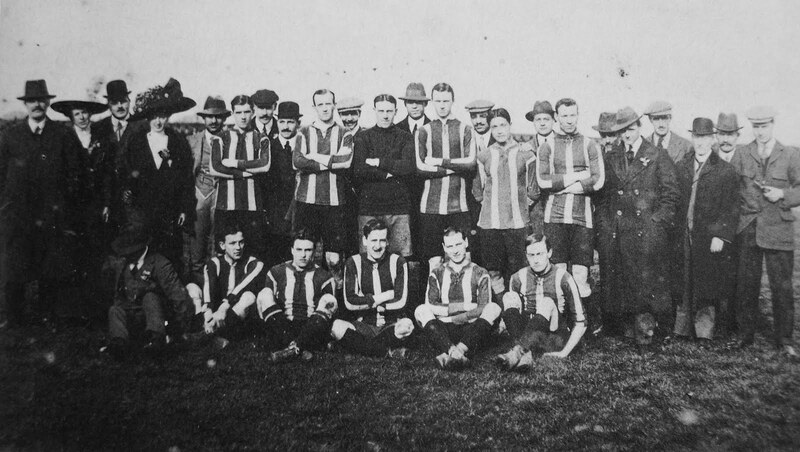 Photographs were taken of the two sides before the match, which was watched by 4,000 spectators. In the 1-1 draw, the Welsh took the lead and England equalized before the break. Later in the game, “England through Kail became extremely dangerous, and after a pretty bit of combination in which some good re-passing was witnessed, the ball was again left in the possession of Kail, who running through, had the goal at his mercy, but shot inches wide.” So ran the report in Cardiff’s Evening Express Mail. A week later on May 1st Scotland were taken on at Molynieux, the home of Wolverhampton Wanderers. It was the first of Edgar’s encounters with the auld enemy, and it turned out to be a game to remember. F.B. Douglas Hamilton, writing towards the end of Kail’s career, recalled how he accompanied the party of schoolboys and the small army of officials on the trip to the Black Country. Several of the youngsters were quite nervous. On arrival the boys enjoyed a bit of sightseeing at the famous oak tree in which Charles the Second supposedly hid from the Roundheads. “What do you think of it?” asked Edgar. One of the boys replied, “I wish I could hide in it while the match is being played.” Douglas-Hamilton kept glancing at Edgar to see if his young friend might also be overawed by the occasion, and consequently fail to do himself justice. However, any doubts he may have had were soon to be dispelled. The following day, in the home dressing room Edgar’s leadership traits were displayed when he half jokingly said, “If any of you chaps are nervous you’ll lose the match first and I’ll punch your heads afterwards.” Before the contest, in front of another 4,000 plus crowd, the team was again photographed with various mustachioed dignitaries. The surviving picture shows a fresh faced Edgar in confident mood. As the photographer packed away his camera, and the players began to take up their positions, Douglas-Hamilton said, “Half a sovereign for every goal, Edgar.” Edgar’s beaming young features instantly took on a furrowed brow, “Money for playing football? !” Edgar queried with a cringe. Even then, he had a horror of professionalism – and he was still only fourteen years old. The Scottish Schoolboys were soundly beaten 6-2, with Edgar bagging a hat-trick. His tally would have been higher but he had a fourth goal disallowed due to a handball. 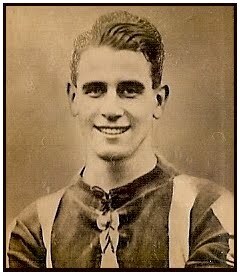 The pick of his goals was described in the classified edition of the Express & Star Newspaper later that evening. “Six minutes after the interval Kail gave England the lead in very fine style. He was challenged by a couple of opponents, but by skilful maneuvering he secured an opening, and let fly, the ball entering the net high up, and well out of the reach of McDonald.” This early report of Edgar Kail’s style of play and finishing would become typical over the next two decades. So, before he had even begun his amateur career at Dulwich, Edgar had already played at a number of the Football League’s best-known grounds. Kail’s next visit to Cardiff’s Ninian Park would be five years later for Dulwich Hamlet, on the road to victory in the Amateur Cup. In Dulwich Park Edgar was still knocking off hundredths of a second from his own speed. Laps of the lake got quicker as he learned how to breathe properly, conserve his lungpower and use his muscle power to get the maximum from his body. With the nation at war with Germany the South London Schools games were toned down somewhat in 1915, and held in Wandsworth rather than the usual lavish surrounds of Crystal Palace. To compensate, schools in the borough of Camberwell were invited to enter their best young athletes into the Dulwich Hamlet School’s fourth annual Sportsday. Held at the Herne Hill Track on Thursday 24th June 1915, Edgar Kail again represented Goodrich Road School in the 220 yards race, and won the final in 29.6 seconds. It is a wonder that Kail picked up an education at all; he never seems to have been at school! Only the previous day he was a cricketing hero at the Kennington Oval, making a record opening partnership of 139 in the annual trial match arranged by the South London Schools Association. For the twenty second year South East London schoolboys met their South West London counterparts in a one sided match that was won by an innings and 36 runs. The record score knocked up by Edgar Kail and his partner J. Robinson apparently lasted for many years after. “Both played,” said the South London Press, [SLP July 2, 1915] “for their age, what can only be described as really good cricket.” In fact, they played the game of their lives, making the game safe before a wicket had even fallen. Kail, honoured with captaining the East team, was the first batsman out. Having hit 9 boundaries, he was eventually caught for 68. In the field he was also quite accomplished, bowling two wickets, and taking a good catch. Edgar Kail’s feats over these two days proved his all round sporting ability. In fact, he now excelled in cricket, track athletics and football. Whichever sport he was to finally decide upon he was certain to achieve greatness in it. We can be thankful that he chose football. The same newspaper that reported the above events also carried the sad story of a local soldier’s recent death in the war that was taking place on the continent. It is an extraordinary coincidence that Rifleman Stanley Peart had not only been a Dulwich Hamlet footballer, but had also once captained the South East London Schools cricket team at the Oval, in 1906. Stan Peart was the third Hamlet man killed in the conflict. He was 23 years old. By the end of the war twenty two Hamlet men were counted among the dead. With the war on the continent increasing in ferocity and in casualties, sporting life in Britain took a backseat. The condition of the grass on a football pitch became almost irrelevant, and at Dulwich Hamlet’s Champion Hill ground things were no different from anywhere else in the country. Weeds had taken root all over the field of play and wild flowers were springing up along the clinker terracing. Nevertheless, to one young man with a great affection for his local club, these things did not go unnoticed. With the support and encouragement of Bert Hardy, Edgar Kail took it upon himself to assemble some of the best footballers in the area that had just left school, to help out at the run down Champion Hill. Most evenings Bill Caesar, Fred Pilkington, Bill Brierly, Alan Braggington, (a fellow pupil at Goodrich Road School) and a number of others, would all meet Edgar at the ground. After the usual kickabout, the youngsters got on with some of the urgent and ongoing jobs that needed doing at the neglected football ground: painting the goalposts, mowing and marking the pitch, scrubbing out the dressing rooms and generally keeping the place from further deterioration. What may have looked like some very menial tasks to some, quickly became a labour of love to these lads. If nothing else it was a character-building exercise for the youngsters who were hearing news of soldiers killed in action each and every day. Their elder brothers, including Fred and Reg Kail, and their cousins were at the Front putting their lives on the line, and they were not going to sit at home and laze about. Anyway, if the war didn’t hurry up and reach a conclusion it would soon be their turn to don the khaki. When the Camberwell Gun Brigade rightly commandeered most of the local open spaces, Dulwich Hamlet found that its ground, which was barely two years old when the war started, was also required by the Military. Amazingly, the Dulwich Hamlet Board, through gentle persuasion and skilful diplomacy, managed to secure the pitch for football. The rest of the Hamlet quarters however, including the grandstand and the ‘old’ pre-1912 enclosure, were all utilized, dozens of army horses tethered round the barrier of the pitch whilst the stand became a harness-room. The Champion Hill ground staff made all the arrangements essential for the comfort of the spectators visiting Champion Hill. This had always been the case, and from time to time the club received letters of praise regarding its stewarding of matches, and this was due in large part to Mr A. Dalhousie Ramsay. Dal Ramsay was known to everyone who made a trip to Champion Hill. A quiet, yet extremely popular man, Ramsay was a regular feature from the turn of the century, overseeing the stewarding duties at Freeman’s Ground and the new stadium built in 1912. Serving on the Committee, it was Ramsay’s responsibility to see that visitors and spectators were well cared for. The assistance received from the keen bunch of young lads allowed him to get on with more pressing needs. As much as Edgar Kail took great pleasure in lending his hand, he also had an ulterior motive for making the daily trek to the ground. He had fallen in love with Ramsay’s pretty young daughter Irene, or Rene as she was known. The walk from Edgar’s home in 13 Nutfield Road to the Hamlet ground took him directly past Tintagel Crescent where the Ramsay’s lived at number four. Mr Ramsay saw traits of himself in the boy (a genial disposition, a thorough sportsman and jolly good fellow), and felt that his only daughter could not have fallen for a more excellent chap. His hopes that the ‘childhood sweethearts’ would stick together for the duration were realized when the couple eventually got engaged in December 1923, and married in February 1926. In September 1916, just as the new season was about to commence, all involved in both amateur and professional football were fully aware, as one report put it, “of the greater game before the nation”. (SLP Sept 1, 1916) Where possible, some sort of play between youngsters and veterans would be attempted, but with Europe now into the third year of the war, and virtually every member of Dulwich Hamlet Football Club on active service, the Club Secretary George Wheeler was prompted to ask in the press, if anyone desired a game to write to him. 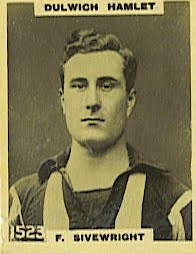 Andy Kempton was the main utility player, and Curly Evans played when available. But priority was given to Dulwich Hamlet members and visitors on leave from the Front, or their call of duty. Edgar Kail was still only fifteen years old; a fresh complexioned, grey eyed, brown haired boy. He was still a little short of his final height of 5’8”, yet he was the first choice inside right, and fast becoming well-seasoned in the national sport. Cuttings from the period reveal the emergence of one of the best loved amateur sportsmen and great footballers of the era between the two world wars. The South London Press from Friday November 3, 1916, reported Nunhead and Dulwich scraping up two teams, “providing their few remaining crocks and friends with a little entertainment.” Kail scored one goal but Nunhead won the match 3-2. A week later, “Kail was first to find the net,” in a 7-2 victory over the Army Ordnance Corps., “the London representative schoolboy, playing in capital form.” He later scored a second goal. He celebrated his sixteenth birthday on Sunday November 26, 1916, although ‘celebrated’ might not be the right word to use in such dark days. The day before he scored for the Hamlet against another top amateur side, Leytonstone, but despite getting the equalizer before half-time, Dulwich went on to lose the match 4-1. 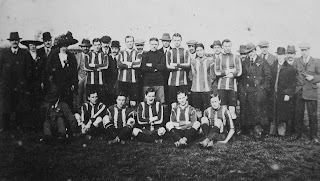 Along with matches against old adversaries Leytonstone and Nunhead, Dulwich Hamlet entertained and visited their old friends from the Guards Depot of Caterham. A team from the Horse Transport was taken on, as were the Royal Naval Depot side from Crystal Palace, the Royal Bucks Hussars, the Army Ordnance Corps, the Scots Guards, the Army Catering Corps and the Royal Naval Air Service. One particular game, against an AOC side in February 1917 saw the ‘crocks and boys’ of the Hamlet win 13-3, with nine of the goals coming from the boot (or head) of Edgar Kail. These visiting sides would invariably contain one or two professional players in their ranks. One Navy team, which included three internationals, got a little more than they bargained for when they faced the young Hamlet team, and were soundly thrashed 6-1. Edgar and his friends fully understood the service they were providing. It was a bit of pleasure for soldiers on leave; and for some who returned to their units at the Front, it was the last indulgence they would know. The on-off partnership Edgar was forging with Sid Nicol and Bill Davis when they were on leave would pay dividends after the war when the trio became the most feared inside forward line in the amateur game. And thus Edgar received the best kind of apprenticeship a fresh-faced young footballer could wish for. The First World War finally came to an end only a fortnight before Edgar Kail was eighteen years old – the national conscription age. What goes through a young man’s mind as such a time draws nigh? There would have been a lot of fear and trepidation, no doubt: but also a characteristic aspiration and preparation to give his all. Fortunately, Edgar would have to wait until the next terrible war before he would serve his country in uniform as part of the Police War Reserve. It is impossible to say what triggered Edgar Kail’s sporting prowess as a youngster; even before his tenth birthday his natural ability was unquestioned. But generally speaking, boys in their formative years are impressionable and seek to emulate their heroes. Edgar’s role models must have come from the football and cricket fields and the athletics track. We can only speculate on who his sporting heroes were, but we can take a good guess. The 1908 Olympic Games were held in London’s White City, and it would seem odd if Mr Kail did not take his sports-loving sons to the Games. Among the many athletes taking part was the flamboyant British sprinter Willie Applegarth. Applegarth held several world records before the First World War in 100 yards (1913 & 1914) and 220 yards (1912, 1913 & 1914) and appealed to the picture card collecting masses and Boy’s Own readers. The tabloids and the sports papers further fired the public’s imagination before he left these shores and became a professional in the United States in 1915. When it came to sprinting, Applegarth was regarded as being years ahead of his time, and his running style was to influence the great Harold Abrahams. It is also inconceivable that the budding batsman did not visit the Surrey County Cricket Club during the summer season. The Kennington Oval was only a fifteen minute tram-ride from Edgar’s home, and Jack Hobbs, the game’s chief exponent with bat and pad plied his trade there. Hobbs was called ‘the Master’, and it is generally agreed that he was one of the most accomplished batsmen the world has ever seen. A charming man of great integrity, Hobbs became the first cricketer to be knighted [in 1953]. Like Edgar, Hobbs’ talent was seen early on. The story goes that he played his first first-class cricket match against WG Grace, who commented, “He’s going to be a good ‘un.” And the old man was dead right. Jack Hobbs went on to smash Grace’s own record of 126 centuries! In his long career, Hobbs scored over 61,000 runs, including 197 centuries. And then there was Hussein Hegazi, the quicksilver Egyptian inside-forward for Dulwich Hamlet Football Club. Hegazi, the crowd favourite and an idol to the schoolboys of SE22, hailed from Cairo, and brought great style and flair to Champion Hill in the three seasons before the War. The similarities between Hussein Hegazi and Edgar Kail (ten years his junior) are striking: both started out as athletics champions, with amazing bursts of speed over short distances; each player, though slight in build, possessed great skill with the ball and a confidence to take on an entire defence single-handedly, which often resulted in a powerful shot and goal; Hegazi later gained international caps for Egypt whilst Kail played at the highest level for England. Thanks to: Dorothy Bedwell (nee Kail), Marjory McKenzie, Callum McKenzie, Colm Kerrigan, Mishi Morath, Roger Deason and Bill Azzi.. Sources: South London Press, DHFC programmes, handbooks and 75 Year Book, Boys Own Annual 1933, The Dulwich Hamlet Story by John Lawrence. I quickly obtained the books – Over The Bridge, The Golden Sovereign, The Voyage Home – and marked every reference to Dulwich Hamlet School, and there were plenty of them. The latter part of the first volume especially is littered with anecdotes and descriptions of life in the Boys department of the school in the Village. We are quickly informed that although Dulwich Hamlet was not a ‘Higher Grade’ school the standard of work was apparently more advanced than many of the other schools in the borough. Now, you may need me to tell you at this point that Dulwich Hamlet Football Club has its foundations in the aforementioned school of the same name. It may also be worth mentioning that one or two characters in Church’s book feature prominently in the early history of the club. So it is with some interest that we can pick up a few titbits here and there that can help us build up a better picture of the personalities of these men. Headmaster, Mr Charles Thomson Hunt is described as “a plump little man with full jowls and iron grey hair… and cool blue eyes.” Church liked him and he liked the youngster very much. They hit it off from the moment they met when his father brought him for an interview. Very soon C.T. Hunt became the chief influence on twelve year old Richard Church. He had a “calm severity, and his personality was a constant force.” He also made the lad begin to realise the quality in the books he read. In fact this was something that Hunt had picked up on in that that very first meeting, and he constantly encouraged the youngster to expand his reading matter. Hunt sounds like a wonderful man, and the sort of teacher we all wished we’d had. Instead of the boys being merely receptive to instruction, he made them stand up before the whole class and get them to say something. (Colin Welland’s character in the film ‘Kes’ springs to mind.) The whole regime at Dulwich Hamlet was very positive. The boys, particularly Church, were enriched with a new found confidence and faith in themselves. The Headmaster and his staff shared in their enthusiasm and took pride in their students. It wasn’t long before Richard Church took a lead in Art and in English, the two subjects he excelled in. His skill in the former helped him eventually win a scholarship to Camberwell School of Arts and Crafts. Such a gifted scholar was he that he even managed to impress Mrs Isabell Hunt, and was invited on a number of occasions to the Hunt’s home in East Dulwich, where he was permitted to thumb through portfolios of engravings and prints of the great masters like JMW Turner. Although C.T. Hunt had only been Headmaster since 1901, like many of the staff at the school he had been around for years and was almost a permanent fixture. He actually started at the school in the 1880s, and was a senior teacher when a certain Lorraine ‘Pa’ Wilson, asked him if he would allow him to use the gymnasium apparatus in the school playground. Pa Wilson, who was running a bible class at the school, was granted his wish and thus began a very successful gymnastics class. It was still going strong at the outbreak of the First World War. In the latter part of the Victorian era much was made of ‘Muscular Christianity’. Indeed, not a few of our top professional clubs began life as football sides associated with Sunday schools and churches of one denomination or other. Tottenham Hotspur, Manchester City, Aston Villa, Birmingham, Bolton Wanderers, Blackpool, Everton, Fulham and Wolves to name just a handful from the Premier League alone. 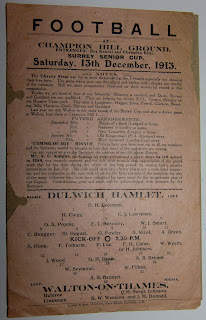 And even the Hamlet’s third eleven played under the name of Dulwich St Barnabas. Pa Wilson was a pioneer in Dulwich, and was once said to be the backbone of the athletic life of the school. The College Chapel Committee enjoyed his presence and he is sometimes found quoting the New Testament in his speeches at club functions. He and his great friend Canon Daniell, the chaplain of Dulwich College, went out of their way to involve the local youths in active sport. Years later Pa Wilson went on record saying that Canon George William Daniell “taught me the mainspring of right action.” And that right action, or moral obligation I suppose, showed itself throughout Wilson’s wonderful career in his goodness, integrity and nobility. Daniell returned the compliment when he said, “The quiet thoroughness of a life like Wilson’s was not without effect upon the people among whom he dwelt. He was an inspirer of many. His sterling qualities won him esteem and admiration.” Wilson’s ‘philosophy’ literally drove him on, and he claimed he was never happier than when he was striving for a thing. Yes, there was much pleasure in the accomplished work, but the greater happiness lay in the doing of it. 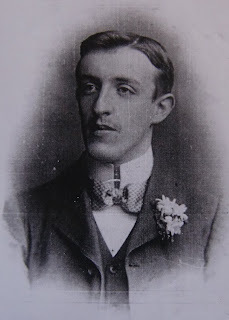 President of Dulwich Hamlet FC, 1893 – 1915. It was thus with such a motive that he agreed to become actively involved in the formation of an old boys club at the Dulwich Hamlet School. He was originally approached by a couple of the lads with a handful of loose change and the challenge was too good to turn down. A meeting was called and sixty old scholars showed up. Others who couldn’t make the meeting sent in apologies and expressed their approval of the proposal and gave their names as members. A committee was appointed comprising of prominent staff members and local dignitaries. Initially Daniell and Wilson took on roles as patrons, with Hunt in the secretary and treasurer’s seat, but this would soon change. Also at that formal constitution the Headmaster of the school, Mr William Brenchley, was appointed as the Club President. 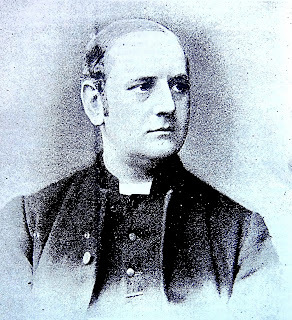 However, Brenchley who had only been at the school for the previous eighteen months or so, declined this lofty position which was instead taken up by Canon Daniell, or lowly Reverend Daniell as he was at the time, with C.T. Hunt as Vice President. Interestingly, Canon Daniell’s grandfather (John Frederic Daniell, 1790-1845) was a noted scientist, and has a crater on the moon named after him! It is located in the ‘Lake of Dreams’ where it now rubs shoulders with the John Lennon Peace Crater. William Brenchley’s tenure as Headmaster lasted throughout the 1890s – and therefore he witnessed the rapid growth of Dulwich Hamlet Football Club. After that he had an illustrious career at Camberwell Borough Council as Alderman and was hugely influential in the establishment of the Camberwell New Cemetery at Honor Oak, Brenchley Gardens. “I am an elm-waif, sir.” replied Church. “I see.” said the Head cautiously. “Well, don’t let it make you late.” And he rode on. 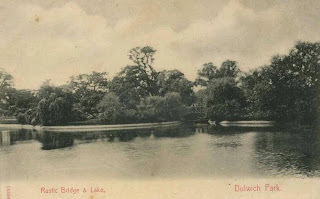 The spirit of Edward Alleyn, Richard Church felt, lingered in Dulwich. The Elizabethan and Shakespearian associations touched the boy’s imagination. The more he listened to the easy discourses of Mr Hunt, the more he identified himself with the environs of the Village, the more he began to appreciate the eloquence of the past – and the tragicomedy of Shakespearian drama. He absorbed the whole atmosphere through his skin and developed a way of reading a book whereby he would contemplate “a physical presence, the author in the flesh”, a sensation which he found both natural and reassuring. But that’s poets for you. Along with the Headmaster there was one other member of staff that Church greatly appreciated. It was the Assistant Head and master of the top standard, where he spent most of his time in the school. Mr George C. Wheeler was an extremely modest and kind hearted man in every way. He had a humility and grace that always deflected any praise that was given to him. He also happened to be the Secretary of Dulwich Hamlet Football Club, which was continuing further up the ladder of success and into the Isthmian League, and with a ‘proper’ ground secured at Champion Hill where they had played since 1902. This is more or less the same site where the present DHFC team play today, over a hundred years later. "Much of our classwork was interspersed with demonstrations of batting technique, or how to bowl breaks, so that today I still recall the Acts of the Apostles as taking place in the neighbourhood of an English cricket field, in perpetual summer weather, and the Magna Carta being staged between Association goal-posts." He treated me with a jocular familiarity that warmed my timid nerves and brought me out as a member of the small community. He soon saw to it that I was made captain of the school, though no sportsman; merely a paint-slinger and a book-worm, as he not infrequently remarked, to the amusement of my school fellows: but no ill feeling on either side. I would sit there grinning at these almost affectionate sorties, and go on my own gait unperturbed. In adulthood Richard Church entered the civil service, but later worked for the publishers J.M. Dent & Sons and became editor to Dylan Thomas, the famous Welsh poet. On the one hand he encouraged the younger poet to publish his verse, but on the other he refused some works by the same author, on the grounds they were too obscene. He is also noted as the first critic to recognise the greatness of William Golding’s ‘Lord of the Flies.’ Other feathers in his cap included a stint as President for The English Association, and Director of the Oxford Festival of Spoken Poetry in the 1930s. He spent just three years at Dulwich Hamlet School, “my most kindly nurse”, and left as a fifteen year old. Yet his time at the feet of such luminaries as C.T. Hunt and G.C. Wheeler made a deep impression on him which the poet and author was to write so fluently about in his memoirs fifty years later. Along with Pa Wilson and several others, these two men were just as much of an influence in the lives of the young players and officers of the football club throughout the first thirty years. The greatness that the club achieved between the wars is due to these firm foundations it was built upon. When George Wheeler was first introduced to Pa Wilson in the mid 1880s, he was told, “This gentleman is very fond of sport.” Quite an understatement! And the feeling was mutual. Separately they both would have undoubtedly achieved great things in some sport or another, but together they were a dynamic force – ‘the mainspring’ that drove things along. Acknowledgements: My grateful thanks to Tim Williamson whose grandfather James Ross Williamson was one of the founder members of DHFC. Sources: Teachers and Football – Schoolboy Association Football in England 1885-1915 by Colm Kerrigan; Over The Bridge by Richard Church; The South London Press, DHFC handbooks. Original article from HH23 Summer 2011. 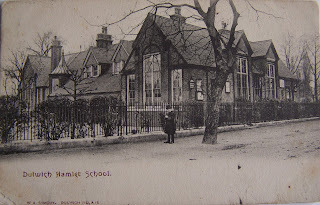 It is generally thought that J.R. Williamson is one of the two lads that handed over to Pa Wilson the one shilling and eightpence (less than ten pence in today’s money) to start up a football club for the old boys of Dulwich Hamlet Elementary School. Williamson would have been about fourteen at the time – the school leaving age. It was with extremely great pleasure then, that one day, at a Hamlet home match, a man tapped me on the shoulder and introduced himself as the grandson of J.R. Williamson. Tim Williamson, who still lives locally in East Dulwich, is very proud of his association with his grandfather’s club. But he was honest enough to confess that he and his late father were really Millwall supporters who only turned up at Champion Hill on the odd occasion to see the Hamlet. In recent years, however, Tim has become a more frequent visitor and now only watches the occasional Millwall match. He now regrets not having questioned his father much about his grandfather. Tim showed me a letter he received from his aging aunt Freda, where she mentions her own father J.R. Williamson. She was only eight years old at the time of his death so she couldn’t say much about him, except that he was a “Director of the club.” He was, in fact, for five years in the 1890s the DHFC Secretary. He also appears to have kept goal for the fist team at some stage in those early years. The letter continues, “I spent many a cold Saturday watching them [the 1920s/30s Hamlet side] with my boyfriend. A football ‘hero’ was Edgar Kail, and his brother Ken was in my class at school and much sought after by the girls – me among them. I thought there was a street named after Edgar Kail but I can’t find it in my A to Z. Oh happy days.” Freda passed away last year aged 96. 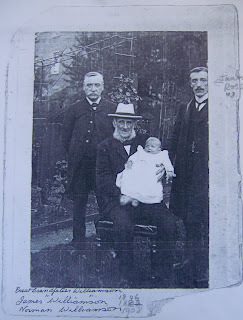 Four generations: James Ross Williamson is on the right. J.R. Williamson, born in 1878, hailed from Scotland and was one of six children born to his parents in Edinburgh. 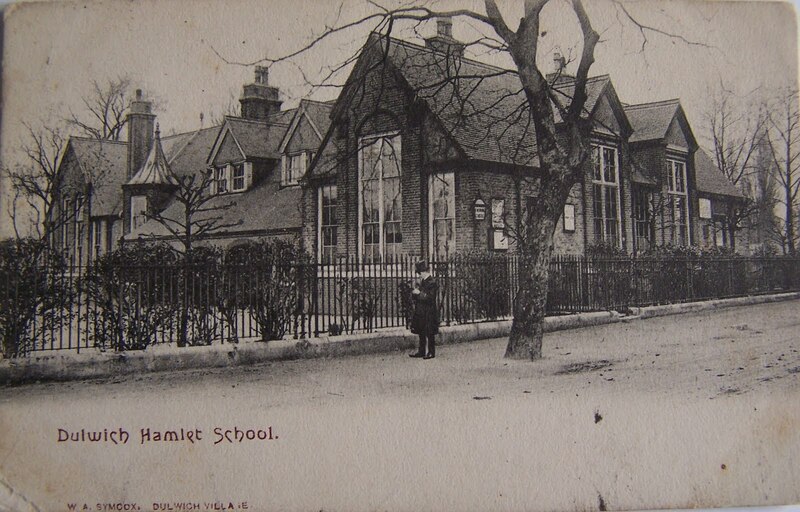 On leaving Dulwich Hamlet School he began to work in the building trade, but eventually ended up working for his younger brother in what became the family business. Williamson’s Electrical Company was established in 1900 by Wlliam Williamson, J.R.’s younger brother, at a location in Rye Lane, Peckham, that was previously used as a museum and a dance hall. The landlord of the premises, presumably as part payment, would receive electrical treatment from William to improve his health. Business was flourishing when William took over the lease in 1912, when many of the local houses were wired up for the first time. He also put in the electrics at Dulwich College, Alleyns School, James Allen Girls School, St Stephen’s Church in Dulwich, two Thomas Tilling bus garages and the headquarters of the Football Association in Lancaster Gate. In the 1930s a shop front was added and goods such as radios, lamps and electric two bar fires were sold. They also ran an accumulator service so customers could keep their radios charged up. Our friend Tim was born above the shop many years later. The company still exists today in East Dulwich. An early handbook from DHFC's time at Sunray Avenue. 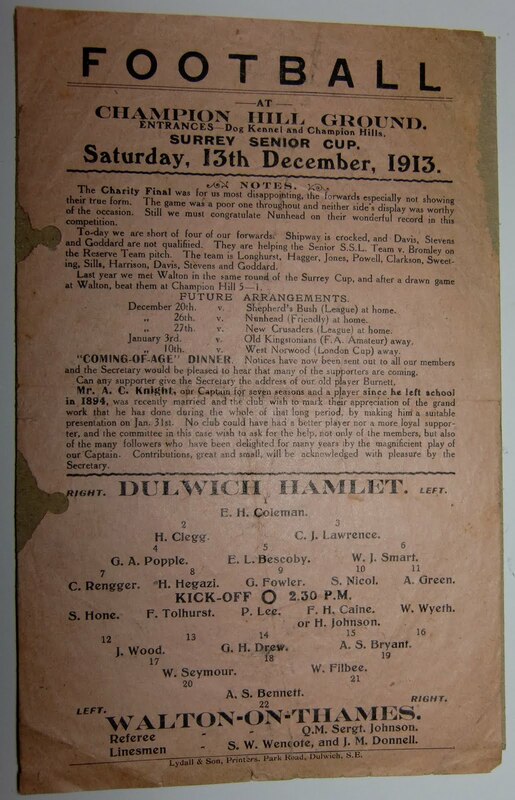 In the very early days the Hamlet played their home matches in Dulwich Park, then Woodwarde Road, on to Burbage Road, then Sunray Avenue before securing Freeman’s Ground at Champion Hill. It was Williamson’s unmarried sisters who had the weekly task of washing the kit. What they muttered when they got the kit bag back after a match played in the ‘part swamp part jungle’ of Sunray Avenue one can only guess. Sadly, J.R. Williamson passed away in 1922 in his mid forties leaving behind ten children – seven girls and three boys. One of the eldest of these, James junior, the father of Tim, was just fourteen at the time. When a twenty year old Egyptian joined Dulwich Hamlet Football Club in September 1911, little was he to realise how much of a controversy he would kick up in the space of a couple of months. Jack McInroy takes a look at the pre-First World War Hamlet sensation, Hussein Hegazi. The game of Association Football was pioneered around the globe, in the latter third of the nineteenth century, by Englishmen stationed abroad throughout the Commonwealth. The British Empire was generally printed in a red tint on the maps of the time, so the world was pink and blue even then! Round stitched leather balls conveyed in the luggage of soldiers, sailors, labourers, businessmen, civil servants, and the like, were thus transported to all manner of foreign climes, where the exponents of ‘soccer’ taught the natives how to play the beautiful game. One of the more exotic places where Britain had its vested interests was Cairo, the capital of Egypt, where the British Army held a strategic military base. The game increased in popularity in the early part of the twentieth century, and where grass was scarce, hardened sand was appreciated as an excellent substitute. Hussein Hegazi was born into the family of a wealthy rural aristocrat in the little village of Kremlah in the Sharkeya Province of Egypt, east of the Nile Delta, on the 14th September 1891. His father, Mohamed Bey Hegazi, spoilt the youngster, who was given virtually everything he asked for. His leather football was probably acquired from one of the British soldiers stationed in Egypt in the mid 1890s. Hussein was rarely seen without his ball, and quickly cultivated skills and confidence. Accuracy in shooting, chipping and passing the ball was developed in a very unusual, let alone costly, way. As the peasant women walked through the village the young Hussein would aim his shots at the large valuable jars they carried on their heads. The peasant women were used to the routine: the ball would fly over, the jar would come crashing to the ground, and the woman would go to Mrs Hegazi for apologies and compensation. As a member of National Sporting Club - a club composed mainly of British exiles - Hussein spent his mid-teenage years competing against teams chiefly drawn from the British army bases, and Government Offices stationed in the Middle East. [Note: Hegazi’s football career, even as a schoolboy, remarkably echoes that of Edgar Kail, nine years his junior.] Indeed, it is highly likely that his close relationship with the Englishmen guaranteed he heard about the great English clubs and the top goalscorers of the day. In his own beloved Egypt, Hussein favoured the centre forward role, and had no wish to play in any other position. Despite his moderate height and light build, he was a prolific marksman - one season he netted an incredible 57 goals! As an eighteen year old, he was part of a native born team that won a prestigious five-a-side competition, which included several excellent military teams. 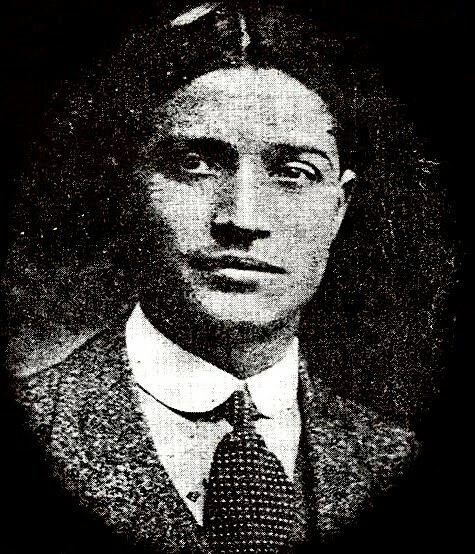 Hussein Hegazi came to London in the summer of 1911 to study Engineering at the University College London. The course took in English; Mathematics; Mechanics; Sound, Light & Heat; Electricity; and Chemistry. Initially he stayed in college accommodation in Gower Street, until he later found private digs at 55 Devonshire Street, W1. At some point around this time Hussein Hegazi came into contact with the Dulwich Hamlet Football Club. How and when we are not told. They certainly did not see him playing for the College, he didn't turn out for them until the following year. He either requested a trial with the South London club, or was seen by a scout during August practising his skills. Or maybe the reputation that preceded him was enough for the Hamlet to seek him out and be first for his signature. Hegazi’s first game in Dulwich Hamlet colours was against the club’s old rivals, West Norwood. 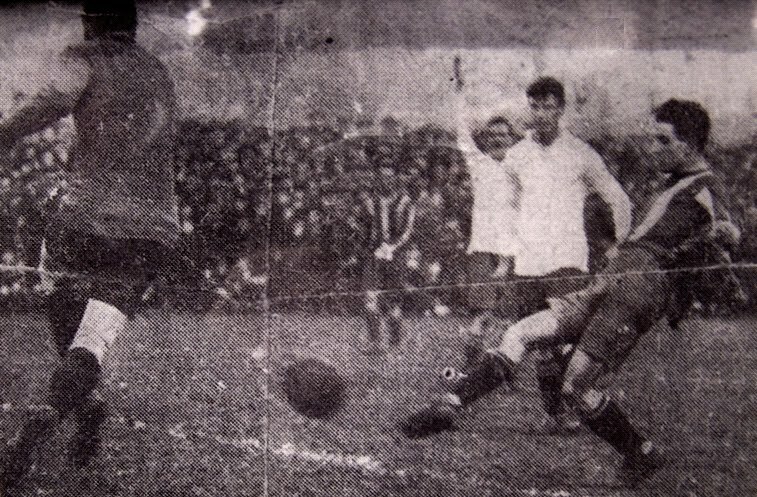 In a pre-season friendly at Champion Hill on the 2nd September 1911 - the curtain raiser to the 1911-12 season - Hegazi was summed up as “Quite a good player, with a lightning drive, but is liable to wander out of his position.” Despite this shortcoming the crowd warmed to the lithe youngster - of five feet nine and just under ten stone - and in a matter of games it was obvious that he was the most exciting thing they had seen for many a day. He could score too, virtually a goal a game on average. As well as the fans - who quickly dubbed him ‘Nebuchadnezzar’ - the critics liked the look of the young Egyptian. And although inclined to wander about and indulge in too much individual effort, he was clearly in a class of his own. After the first league match, one local reporter confidently predicted that Hegazi “should make quite a name for himself in English amateur football.” Those prophetic words would come to pass sooner than anyone could imagine. He literally ran the show: sprinter, playmaker, dribbler. So untypical of the classic centre forward - a big number nine goalhanger, knocking the ball in the net from six yards with any part of his body - Hegazi’s goals were sweet goals. A goalscoring machine, yes! but much more besides. His ball control was superb, his distribution second to none, and with the young George Shipway to his immediate right, and J.A. Cleland at inside left, he completed quite a formidable inside trio. As the season progressed it became evident to all and sundry, that Hegazi would be far better suited to a feeder position than his own favoured centre forward role. Indeed, the following season, Hegazi and Shipway moved to inside and outside right respectively, to make way for N.A. Carson to lead the attack. The beautiful game has always been best-suited on grass, but most surfaces; clay, sand, grit or tarmac will do. In England during long spells of bad weather – it was played on a bog. Like most of us, Hussein Hegazi favoured the truer surfaces. He also liked to feel the ball, and rather than the cumbersome boots of the Englishman, he preferred to play in soft shoes. One gets the impression they were, what we would describe as ‘desert boots’; suede uppers with a crepe sole. Maybe he had them specially made, like the much later Stanley Matthews who employed the finest Italian cobblers with the finest Italian leather for his boots. The reports we have describe how Hegazi found it difficult to keep his footing in wet conditions, suggesting these soft shoes were without studs. However, one photograph of Hegazi clearly shows him wearing studded boots. On his arrival in Fulham a considerable amount of curiosity was aroused regarding the personality and prowess of the young Egyptian. He was given a generous reception, and his impact on the game was immediate, despite his natural nervousness on such an occasion. Straight away he produced evidence of the ball control which had earned him so many plaudits, and after just 15 minutes he opened the scoring. Snapping up a centre from Smith’s corner, he “slipped round Graham, and neatly placed the ball into the net, wide of McIver. He was warmly congratulated by his new colleagues, and he merited it.” (Athletic News). The promising youngster supplied his fellow strikers with further goalscoring opportunities as the game progressed. His first touch on receiving the ball, and his excellent distribution were also noted. Rain fell throughout the second half, and though “the Egyptian tired ... he had done enough to prove that the claims made on his behalf were not all exaggeration. Some of the passing movements in which he, Coleman and Brown indulged in in the first half were quite delightful.” English League football had been an enjoyable experience for him. “It was totally different from anything I have been used to.” said the youngster. He had proved a success, and was instantly selected for the Fulham team that would be travelling up to Leeds the following Saturday. Fulham were not the only professional club after the services of the gifted Egyptian either. Hegazi showed Wilson and Wheeler a letter he had received from a North London club that also expressed an interest in him. Hegazi, though obviously flattered by the invitations, wished that the offers would stop. A few days later he informed Fulham that he would not now be travelling to Yorkshire with the club to play against Leeds City. Instead, he pledged his future with Dulwich Hamlet for the remainder of the season by signing the F.A.’s Form L, restricting him to one club only. Fulham’s manager Phil Kelso thought that to be a regrettable decision, yet hoped that Hegazi, if opportunity allowed, would still train on the odd occasion with the Cottagers, and maybe even sign up the next season. Pa Wilson’s respect for professionalism, however, was at vanishing point. He wrote a stinging letter to the press that week against the poaching tactics of professional football managers. 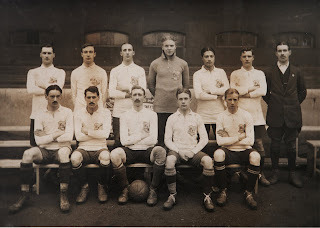 Because of this controversy it appears that the entire Hamlet playing staff signed a letter to the Football Association requesting protection under Rule 37, which said “...no club or person shall attempt to induce the player to leave his club during the season without at least 14 days notice in writing to the club, or clubs, to which he has notified he is a playing member.” This is also most likely the reason why Charles Tyson did not appear for Southampton that season either. That he is fictive, and not in these isles. Himself in neat Dulwich jersey he dights. Flurried and fearful and fluctuant foe. Learned on the banks of the Nile how to sprint. Egypt of course, has a magical history. Look at her Pyramids - likewise her Sphinx! Sort of a mystical beetle methinks. Hussein’s a terror whenever he shoots. So are the Ten Plagues of Egypt, I hope. Wisdom display when they silently slope. Hussein, you know, who’s a plague to most backs. If for high amateur honour she fails. Backing the luck of this lad from the Nile. 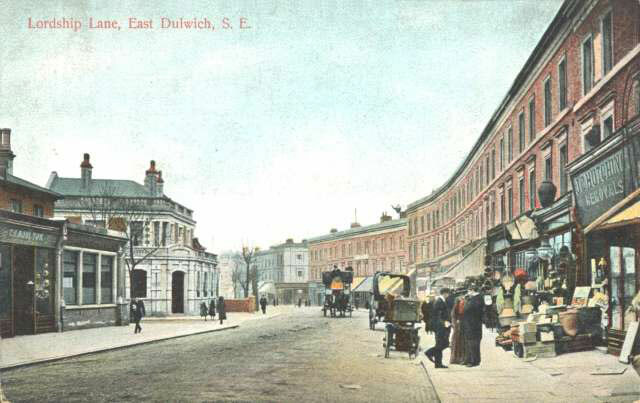 Debate continued for some weeks regarding the pain of Dulwich and the piracy of Fulham. The latter club finally retorting with “Let us not forget that if great clubs ‘live’ on lesser clubs, the lesser ‘live’ on the least.” A charge that Dulwich Hamlet were somewhat hypocritical - happy enough to pick off the best players from the local junior sides, but (by sweet words) willing to hold back a great talent, who would like to progress to a bigger club. The controversy, however, served only to bring Hegazi into the public eye, and to the mind of the County selectors. He was chosen (along with his Hamlet colleagues Arthur Knight and George Shipway) to lead the attack for the London F.A. eleven, against Middlesex on the 7th December 1911. It was the first of five games he played for the County in the next fifteen months, gaining him a cap and badge. He continued to play great football throughout the remainder of the season, and score some spectacular goals in the process. But from some quarters he was looked upon as slightly schizophrenic. This report after a January 1912 cup-tie with Metrogas, “Hegazi was a curious mixture of brilliance and ineptitude. His marvellous leap to get his head to a fine pass from Sills in order to score Hamlet’s goal was the most notable incident of the whole game, but his missing of a penalty where he sent the ball very wide indeed was almost ludicrous!” It is comforting to know that in the same game Metrogas also missed from a spotkick. Dulwich won no trophies but reached two finals and a semi final in Hegazi's first season at the club. Undoubtedly everybody’s player of the year, the young teetotaller would have celebrated the season’s close with a lemonade or something, not that alcohol was ever allowed in the Hamlet boardroom in those days! 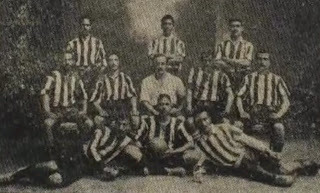 Two continental tours enjoyed the presence of Hussein Hegazi in the spring of 1912. He was becoming quite a globetrotter. As centre forward with the Hamlet, he took part in the club's three drawn games in Holland. But it was further afield to Prague in Bohemia (now part of the Czech Republic) that he travelled with the University College London football team. Their first opponents were Slavia F.C., who in their time had already claimed the scalps of the likes of Middlesborough and Woolwich Arsenal. A 6,000 crowd turned up to watch Hegazi and co. take on the Slavia side. [Presumably the same Slavia Prague as today, who later won the Czech League eleven times between 1929 and 1943.] A tall order for the Londoners, some of whom had not fully recovered after the thirty hours non stop journey that included a turbulent sea passage followed by twenty hours aboard a train, and without a shave to boot. They lost 5-0. A second game against Slavia also ended in defeat, this time 6-1. However, “Early in the second half, Hegazi, amidst tremendous cheering, scored our only goal.” (Union Magazine Vol.V No.5 June 1912.) The college students might have thought that their next game against the Bohemian Universities would be easier; until they discovered that seven of the Slavia side were assisting them! They did manage a 2-2 draw, however, and Hegazi got one of the goals. Leaving Prague, the team were determined to win their final game of the tour against Olympique Lillois A.F.C. when they stopped off in France. This team had won the French championship only the year before, and so when Hegazi completed his hat-trick to make the final score 3-0 to the tourists, they really must have felt that they had accomplished something. We’ll never know how Hegazi felt upon completing his first season in British football, but I’m sure, like most of us, he would have been pleased with some things and disappointed with others. He was a model professional, or amateur rather, and always conducted himself in the Hamlet spirit. Before the start of the following season, 1912-13, Hussein Hegazi signed amateur forms for Southern League 2nd Division outfit Millwall Athletic making two appearances for them. There is some confusion to which Millwall side Hegazi actually turned out for, as records show that the reserves alone were involved in three separate league competitions – the London League Section A, the Kent League and the Southern Alliance League. Hegazi made his debut at Croydon Common on Wednesday 11th September 1912. Millwall lost 3-1. This match actually preceded Dulwich Hamlet’s opening fixture by a few days. Hegazi did not play in the Hamlet game on the 14th. His first appearance that season was saved for the opening of the new Champion Hill ground on 21st September 1912. On Thursday 3rd October Hegazi made his second and final appearance for Millwall in a Southern Alliance League match. For the home game versus Cardiff City, the South Londoners fielded only one regular player among the eleven - the goalkeeper, Spendiff. The average Lions fan coming through the turnstyle at the Den must have felt cheated at the large number of unfamiliar faces on display, and who was this strange foreigner at centre forward? The London newspapers, championing the grievance of the home supporters, condemned Millwall’s action, and despite Cardiff’s 3-2 victory, the South Wales Echo echoed with, “Millwall flagrantly broke the Alliance rule which says that the club shall play at least seven of the players that took part in the previous Southern League match.” Whether this small storm of protest upset Hegazi we do not know, but every time he tried his luck with the professionals he seemed to court controversy. It wasn’t his fault, he just wanted to enjoy his football. He didn’t play for Millwall again - in fact, apart from County, University and representative games, he stuck it out with Dulwich Hamlet. However, Fortune had it that Hussein Hegazi’s tenuous link with Millwall saw him find a place in the team photograph of that year. Hegazi can be seen in the back row wearing a hat and suit. It was around this time that he joined one of the world’s best known centres of learning, when he began his studies at Cambridge University. An entry in the admissions register of St. Catharine’s College, Cambridge, for October 1913 shows “Hussein Hegazi ...admitted Pensioner.” (i.e. a Cambridge University scholar who pays for his own commons.) He is recorded in the Michaelmas term registers (Sept to Dec) attending some lectures in Physics. Entries found in the tutorial accounts, show he kept only two terms. For some unknown reason Hegazi withdrew from his course before the first year was ended. But not before he won his Cambridge blue. That event took place on the 7th January 1914, when the Cambridge University soccer team beat their Oxford counterparts 2-1 at Queen’s Club, in the mud, in what was described as the best Varsity game for many a year. For the Summer Term of 1914, Hegazi was marked absent, and his caution money was returned in March of that year. He finished the season with the Hamlet and returned to Egypt. It is possible that he sensed the coming turbulence in Europe, in the summer of 1914, but it is more likely due to the unrest in Egypt - at a time when a new group of leaders were being ushered onto the political stage - which eventually brought about independence in 1922. Hegazi’s departure was English football’s great loss. Had Hussein Hegazi remained on these shores for the duration of the war he would have qualified for a place in the great Corinthian side of the 1920s. Instead he headed home before the hostilities began. Within weeks of Hegazi’s departure, Lord Kitchener, the Proconsul of Egypt, came to London to take up his role of Secretary of State for War. Later promoted to Field-marshal, Kitchener masterminded the recruitment drive that drafted the nation’s youth for war with Germany with his ‘This Country Needs You’ campaign. Virtually every one of Hegazi’s British male friends – both student and fellow footballer – were involved in the most terrible war the world had seen. Some of them even lost their lives, including several of his Dulwich Hamlet comrades who had warmed to the young Egyptian. Amazingly Hussein Hegazi failed to pick up a single winners medal during his stay with Dulwich Hamlet Football Club. He was clearly a star, but perhaps a star born too early. When Tutankamun’s tomb was discovered in the early nineteen twenties the western world turned to Egypt for its fashions, designs, architecture and mythology. What a fitting time that would have been for the gifted youngster to be playing for Dulwich Hamlet. Of course, he would have been vying with the legendary Edgar Kail for the inside right position, though I’m sure the team selection committee would have found a place in the side for the pair of them. Instead, Hussein Hegazi was back up the River Nile continuing his sport with a team that he handpicked, called the 'Hussein Hegazi Eleven', then sometime after he had another spell with his old side Al Ahly in Port Said. It was with Ahly (voted the African team of the twentieth century) that Hegazi went on to became one of the most popular players of his day. 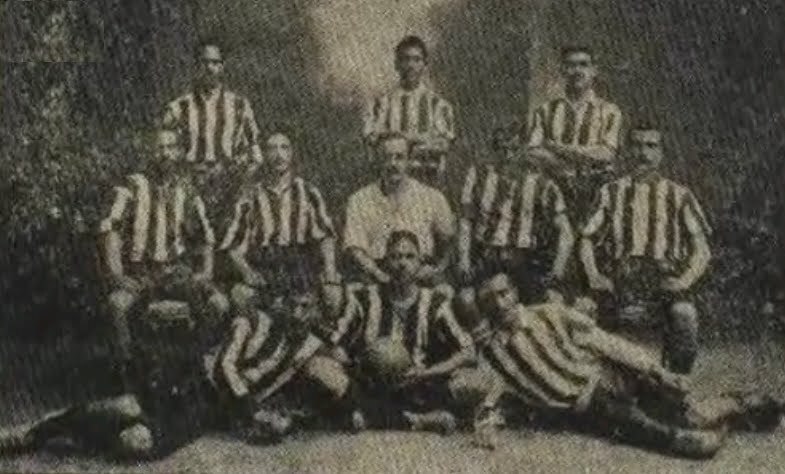 In 1919 he moved on to fierce rivals Zamalek unti 1922, when he joined Sekka Railways, the oldest club side in Egypt. 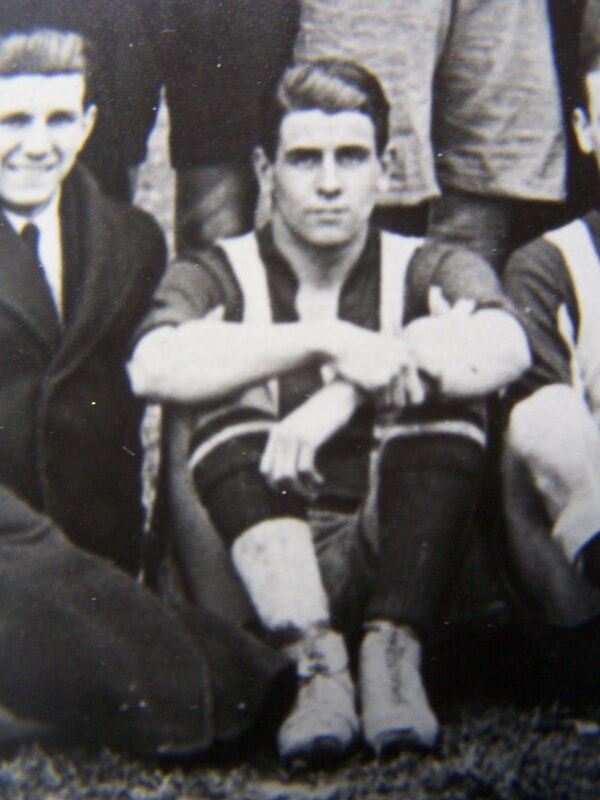 A couple of years later he was back with Al Ahly where he remained until 1928. He then returned to Ahly for one season before finshing his career with Zamalek. His final match was a 1-1 draw between the two clubs. The great fame Hegazi enjoyed, along with the large estate he inherited from his father allowed him to finance his two great interests in life. The first, of course, was football, and here his generosity knew no bounds, as he is known to have financially supported the travels of the teams he played for. The second was women. It turns out that Hussein Hegazi, despite being married with five children, was a bit of a womaniser! The celebrity lifestyle, socializing with other rich and famous personalities, including leading actresses and dancers, inevitably led to his frequent infidelity. So, off the field, Hussein Hegazi was not so honourable as he was on it. What Hegazi’s wife made of it all is a mystery. Having grown up in a rural environment, she found it very difficult to adapt to city life in Cairo, preferring to remain in the family mansion in Kremlah. Meanwhile, her husband and children (and their nanny) lived in an apartment block in the Garden City district of Egypt’s capital. That home is still standing today, and is even now inhabited by some of Hegazi’s grandchildren! It is situated on the corner of Kasr Elainy Street and Hussein Hegazi Street, named in honour of its once famous resident. Hussein Hegazi died in his native country in 1960. Original article from HH3 Winter 1998 (Revised 2003). scarabs - species of beetle deified by the ancient Egyptians. The best known is the dung beetle, that collects and rolls up pieces of dung into a large ball. This it manoeuvres into underground egg chambers. The dung beetle was a symbol of the sun god, the Egyptians believing the sun was pushed round the sky in the same way the beetle rolls its ball of dung. I am very grateful to Mr Eldeeb, General Secretary of the Egyptian F.A. ; Professor J.H. Baker, Keeper of Muniments, St Catharine's College, Cambridge University; Ms Joanna Shacklock, Records Office, University College London; Hassanin Mubarak; Mr Dean Hegazi and a near kinsman; and Mr David Fowkes, Secretary of the London F.A. for their help in piecing together this article.